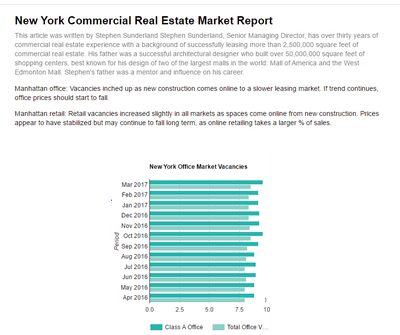 Related Companies and Oxford Properties Group secured $5 billion in construction funding for a 90-story office tower and connected mall at Hudson Yards. The announcement marks a major step towards completion of the megadevelopment on the far West Side. Smith Limousine Company sold 624-636 West 47th Street, a Midtown West development site with 95,000 buildable square feet for $36.5 million. The property consisted of a two-story, 21,670-square-foot building. The deal closed for about $384 per buildable square foot. 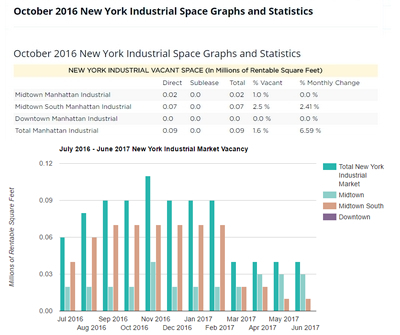 George Comfort & Sons and ASB Capital Management acquired 7 West 18th Street, a nine-story, 46,000-square-foot Flatiron District commercial building for just under $44 million from Scandia Realty for $43.75 million. 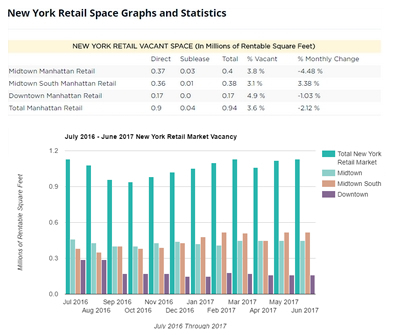 Cornell Realty Management bought 259 West 34th Street for $20.5 million, a 6,418-square-foot retail property, comprising of a total of 21,690 buildable square feet. The building is currently occupied by a Wendy's restaurant and has belonged to the Moran family since 1977. 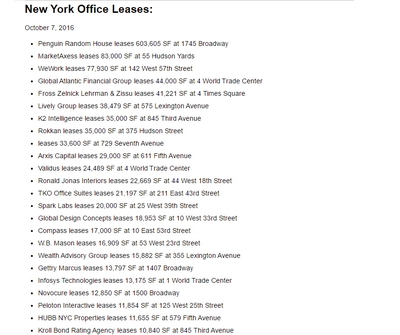 Dalan Management bought 22-24 West 38th Street, a 70,000-square-foot office building for $43.5 million, or $620 a foot. Dalan plans to revamp the property for tenants in the technology and creative service sectors. The 12-story building had been under the same ownership since 1978. Gemini Real Estate Advisors sold 37 West 24th Street for $60 million. The property is a 124-key Wyndham Garden at 37 West 24th Street. Fortuna Realty Group bought the hotel. One of the partnerssued the other two and accused them of moving to sell the properties without his consent. 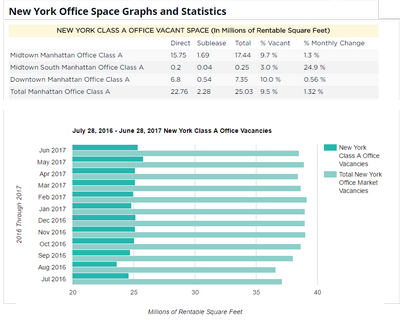 Ponte Gadeapaid $145 million for 490 Broadway in Soho from family owners, Train City Ltd.
Duell Management sold 957 Park Avenue for 16 million, 27 Washington Square North for 20 Million and 1611 Madison Avenue for 40 million in three separate transactions. 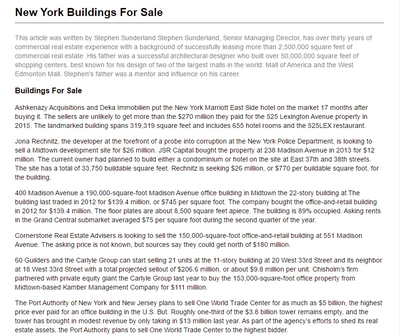 Alduwaliya Asset Management">Alduwaliya Asset Management paid $123.5 million for a 17-story, 208,000-square-foot office buildingat 250 West 39th Street from Lincoln Property Company. 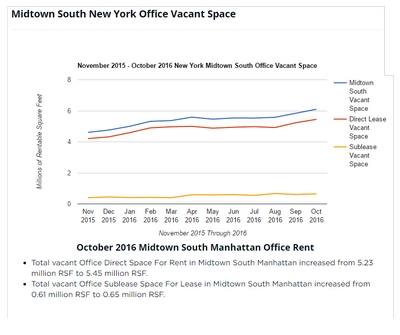 The building located between Seventh and Eighth Avenues is nearly at full occupancy, and average office asking rents are in the $40s per square foot. The deal closed for just shy of $600 per square foot. 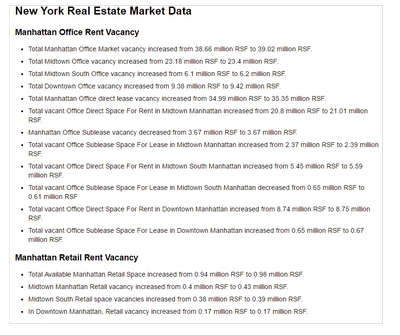 Rhodium Capital Advisors bought six Upper Manhattan buildings for $34.1 million. 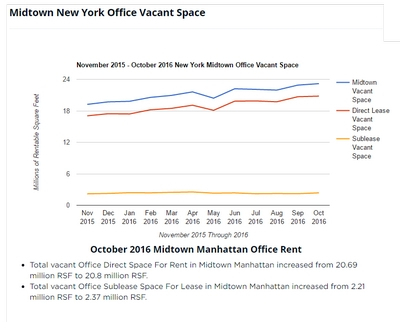 The buildings are located at 100 West 143rd Street, 118 West 137th Street, 210 West 133rd Street, 22 Bradhurst Avenue, 243 West 135th Street and 515 West 156th Street, comprise a total 109 rental units and nine retail spaces across 89,873 square feet. 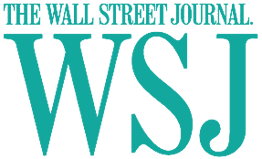 William Macklowe Company and a subsidiary of Iowa-based Principal Financial Group acquired a 14-story office building in Hell's Kitchen from Atlas Capital Group for $107 million. 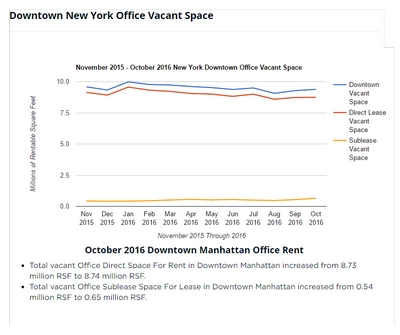 Isaac Chetrit and Ray Yadidi are in contract to buy 235,000 square feet of air rights from Himmel + Meringoff Properties which are the unused development rights from 1352-1362 Broadway. When completed Chetrit and Yadidi will have gathered an assemblage spanning roughly 375,000 buildable square feet. Thor Equities bought two Lexington Avenue retail properties in Harlem for $75.5 million. The larger building, at 2082 Lexington Avenue, stands six stories and encompasses 59,000 of space.The other is a three-story, 44,000-square-foot building at 2080 Lexington Avenue. Slate Property Group and RWN Real Estate Partners obtained a 40,000-square-foot rental building opposite Baruch College for $29 million. The buyers plan to expand the residential componentat the 10-story building, located at 144 East 24th Street. 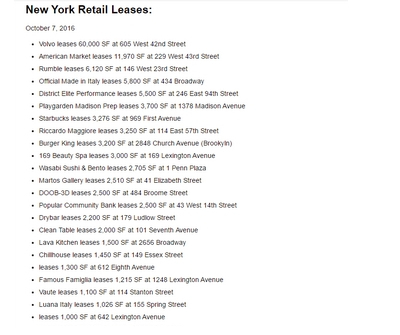 They will also increase the retail presence on the ground floor. Status Capitalbought the retail and office building at 820 Madison Avenue for almost $7,000 per square foot.Duell Management Systems sold the five-story, 6,700-square-foot property between East 68th and East 69th Street in Lenox Hill. The Jackson Group acquired a five-story retail and commercial building at 712 Madison Avenue for $83 million from Duell Management Systems. The roughly 5,500-square-foot building is located near East 63rd Street. Maefield Development acquired the leasehold interest in the Doubletree Guest Suites Times Square hotel from Sunstone Hotel Investors for $540 million. The deal for the 468-room hotel at 1568 Broadway is valued at just over $1.15 million per key. There is a planned redevelopment of the property into a premier cultural entertainment, retail and hospitality experience. 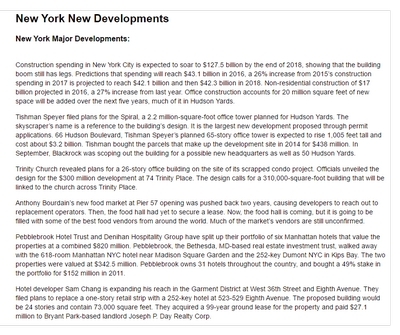 Chetrit Group">Chetrit Group and Cornell Realty Management swapped a property for another pair of buildings owned byinvestor Charles D. Cohen that would make way for separate retail projects on 34th Street. Cornell Realty Management closed on the purchase of a pair of one-story retail buildings at 245-247 West 34th Street in Chelsea from Chetrit and Cornell. Chetrit and Cornell bought them for $31.5 million and proceeded to file plans for a 17-story, 45,000-square-foot hotel-and-retail project at the site. In exchange for the two buildings, Chetrit and Cornell agreed to buy a three-story retail building at 261-263 West 34th Street, which Cohen has owned since 1983. RXR Realty is selling a 49% stake in its 61 Broadway office tower in the Financial District. The deal values the 33-story building at $440 million. RXR acquired the stake from Broad Street Development for $330 million in May 2014.